Readers pay a monthly fee, have unlimited borrows; Writer get paid per page-read. 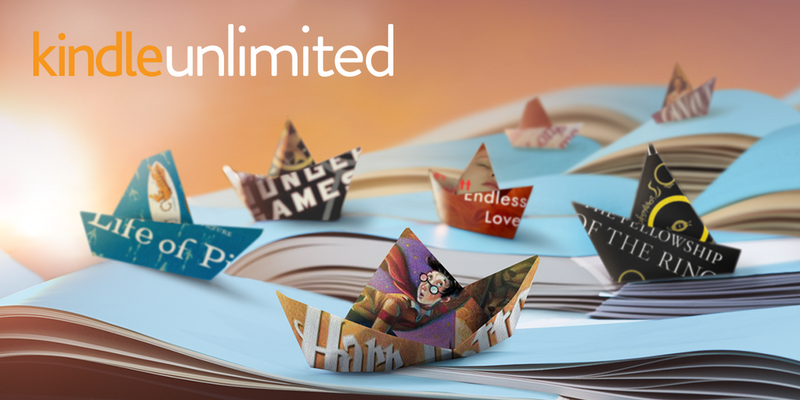 Amazon gave indie authors an unexpected data-gift by releasing the number of page-reads in June along with the payout for the KDP Select program ($11M for the pot divided by 1.9 billion page reads = 0.6 pennies per page). Here’s my breakdown on the numbers you want to know in the newly launched (today) page-read system in KDP Select program. 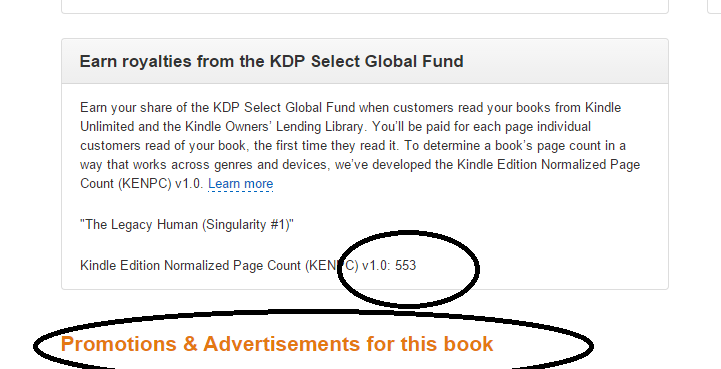 Find the KENPC page count for your book under the Promo&Advertising tab in KDP. *even though I write both serials and novels, I think this is a good thing. 2) The 0.6 penny payout per page in the NEW MODEL is roughly equivalent to 1 penny per page under the OLD MODEL. Why? Because the pagecount is higher with the NEW MODEL. A penny a page is about halfway between what serials and novels were getting under the OLD MODEL. In other words, Amazon leveled the playing field, bringing the payout for novels up and the payout for shorts down… but the overall money in the system about the same. 3) The system hasn’t changed for readers, so borrow rates, at least for now, should be similar to before. 1) Serials still make money with borrows, just not outrageous amounts like before – my 15k novella is making 51cents per borrow vs. 35 cents per sale (assuming 100% reads). This means KU for serials and shorts still makes sense. 2) I’m putting my serial boxsets in KU, as long as they don’t have a permafree first episode – because I suspect read-through will be better, plus putting borrows on the box set increases visibility. 3) Otherwise, I’m holding tight (keeping most properties where they are right now) to see if the payout rate really is 0.6 pennies per page in August. 4) Borrow payouts are more comparable to sales earnings now… depending on your pricing, page-length, page through-read, etc. My 98k novel lists for $3.99, which is $2.79 for a sale, but $3.32 for a borrow. My 15k novella lists for $0.99, which is $0.35 for a sale, but $0.51 for a borrow. All of that is assuming 100% read-though rates, which is overly optimistic, and that the 0.6 pennies per page rate holds. The payout for borrows is comparable to sales at approximately 70-85% read-through rate. When you add in the extra visibility for borrows, and the fact that readers aren’t paying for borrows (and thus more likely to download vs. a sale), this means KU is potentially lucrative for both shorts and novels. The pagecount displaying on your Amazon description is closer to a print-based 250 words/page, whereas the new KENPC page count Amazon is using is closer to the size of a Kindle page display, or around 175 words/page. Interestingly, the words/page conversion rate appears consistent across all my works (crossing genres, serials, novels, etc. )… but it varies from author-to-author. I’ve seen everything from 151 words/page to 233 words/page in individual authors. In other words, words/page conversion rate appears to be a function of the author’s style. A couple friends volunteered their manuscripts for tribute to analyze exactly how this was happening. This is a subjective analysis, but I standardized everyone’s format (spacing, etc, doesn’t matter for KENPC calculations anyway, see here) and analyzed for size of paragraphs, number of sentences per paragraph, number of words per sentence, etc. Basically, the fewer sentences per paragraph and words per sentence (aka more dialogue, or your style is closer to Hemingway than Franzen), then your number of words/page will be lower (and lower is good for payout rate). Check across your books, but I’m finding my works are consistently between 170-175 words/page… that’s just my style, and it apparently doesn’t change dramatically from work to work. So, for planning purposes, I can use that number to see how much a certain work will fetch in the borrow system. To KU or not to KU? Everyone will have their own answer to this question. If you are against the subscription business model, by all means opt-out. But understanding how it affects the marketplace is important for everyone. Serials and shorts may not be as lucrative as before, but they still pay better under the borrow system than as sales. And now that KU is blind to the length of your story, you’re free to craft it however you like… and given that readers seem to love short stories and serials (at least in romance, but increasingly in other genres), I don’t expect those forms to go away. And KU still offers the benefit of increased visibility (due to borrows – ranking is not related to page-reads), so KU titles are likely to continue to dominate the bestseller charts. Overall, the page-read system rewards writers whose stories keep readers turning those pages… no matter what form those stories take. As always, giving the reader what they like to read is the best strategy of all (see this excellent post to that effect by Hugh Howey). LOL! I love that… a new barometer for us to judge ourselves. Now I want to know what JK Rowlings' words-per-page are! Realistically the amount per borrow would be .005 based on the 1.9 billion pages read last month and $11 million pot. Dang it, per page…per page. thanks for sharing this at KBoards. Alan, read your post too. There seems to be a consensus amongst the ones who are doing analysis around the 0.5 to 0.6 cents per page figure. That's what I'd bet on too, if I were a betting man. Very interested in seeing how this pans out. It wouldn't surprise me to see Amazon nudge this figure up for the first month or two at least to draw in some more of the bigger names back into the program. We'll just have to wait until mid August to know for sure. I ran a test yesterday that seemed to show that the "standard" page format isn't. I had two works (87k and 95k) where the longer work showed a lower KENPC. I reformatted both with the same font size (the longer work was 11pt originally, while the shorter was 12pt) and the KENPC changed dramatically — the longer work now has more pages in KENPC than the shorter. So I think there is (or at least was yesterday) a problem with their "standard" calculations. I wouldn't be surprised if there's some glitchiness in the beginning – although I'm surprised your font reformatting made a difference. Simply because font isn't preserved anyway in reflowable text (readers choose their own). But I've found most of the authors have pretty consistent results. One author had some wildly off numbers. I think if you see something hinky, you should probably contact Amazon. How does this mesh with the other news we had this week, about subscription models at D2D and Smashwords? There's trouble down the pike, the way I see it. It's time to start putting graphs together showing subscription model subscribers and the authors that are opting in and out. Start looking for trends, build the data. There's a big business story happening here for those that want to look, and get a lot of credit for ferreting it out. That other news was about Scribd dumping a whole bunch of books out of the system because they were bleeding money. I think the moral of that story is that Amazon's doing it smarter than Scribd. Thanks for the information. You mentioned putting your bundles in KU. But that means those individual books will also have to be in KU, right? Yes… but for my serials, the individual episodes are already in KU. Except for the first season, which has a permafree, which is why I mentioned that I wouldn't be putting those box sets in KU. Thanks for going into all the numbers! Thanks for sharing the numbers and info. It was very informative and helpful.